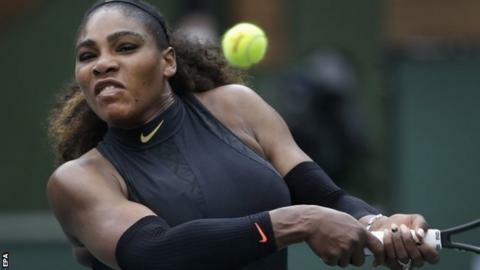 Serena Williams will play her sister Venus in the third round at Indian Wells as she continues her comeback after the birth of her child. The 36-year-old American, who was out for 14 months, beat Kiki Bertens of the Netherlands 7-6 (7-5) 7-5 in round two. "Everything is a bonus," said Serena after winning in one hour, 52 minutes on her second match point. The sisters last met in the 2017 Australian Open final, when Serena won her 23rd Grand Slam singles title. "I would prefer to play someone else, anybody else, literally anybody else, but it has to happen now. So it is what it is," said Serena. Serena was already pregnant with daughter Alexis Olympia, who was born on 1 September, when she beat Venus 6-4 6-4 in Melbourne. Venus beat Sorona Cirstea of Romania in her second-round match 6-3 6-4. They will play their 29th competitive match on Monday, with Serena having won 17 of the previous 28. "She looked like she never lost a step," Venus said of her younger sister. "Great way to come back." Defending champion Elena Vesnina of Russia also moved into the third round after she beat American Catherine Bellis 2-6 6-1 6-1. Danish second seed Caroline Wozniacki beat Spaniard Lara Arruabarrena 6-4 6-1, while Ukrainian fourth seed Elina Svitolina defeated German Mona Barthel 6-4 6-3. In the men's competition, world number one and top seed Roger Federer took the first set against Argentina's Federico Delbonis 6-3. The Swiss has never beaten Delbonis - though they have only met once on the tour - and the pair were level at 2-2 in the second set when play was suspended for the day because of rain. They will resume their match on Sunday, when British number one Kyle Edmund faces the experienced Israeli Dudi Sela in his opening singles match. Elsewhere, third seed Grigor Dimitrov of Bulgaria lost 7-6 (7-4) 4-6 6-3 to Spain's Fernando Verdasco, but Austrian fifth seed Dominic Thiem beat Stefanos Tsitsipas of Greece 6-2 3-6 6-3.